This book contains the fully peer-reviewed papers presented at the Third Engineering Foundation Conference on Small Fatigue Cracks, held under the chairmanship of K.S. Ravichandran and Y. Murakami during December 6-11, 1998, at the Turtle Bay Hilton, Oahu, Hawaii. 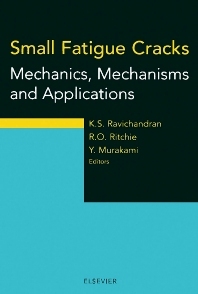 This book presents a state-of-the-art description of the mechanics, mechanisms and applications of small fatigue cracks by most of the world's leading experts in this field. Topics ranging from the mechanisms of crack initiation, small crack behavior in metallic, intermetallic, ceramic and composite materials, experimental measurement, mechanistic and theoretical models, to the role of small cracks in fretting fatigue and the application of small crack results to the aging aircraft and high-cycle fatigue problems, are covered. For students, researchers and practising engineers alike in the fields of materials science, mechanics and mechanical engineering. Chapter headings and selected papers: Preface. Nucleation of Small Cracks and Stage I Growth. A theory of fracture with a polygonal shape crack (T. Mura). Micromechanical simulations of stage I fatigue crack growth under multiaxial loading (V. Doquet). Theory of Small Cracks. Analysis of small crack growth behavior using unified approach (K. Sadananda, A.K. Vasudevan). Small Crack Growth in Structural Alloys. Fatigue crack tip constraint and closure as a function of crack length (D.L. Davidson). The role of near-threshold small-crack behavior in life prediction of titanium alloys for use in advanced turbine engines (J.M. Larsen et al.). Mechanisms of fatigue crack nucleation of surface and subsurface regions and their effect on fatigue life of Ti-10V-2Fe-3AI (S.K. Jha, K.S. Ravichandran). Initiation and growth behavior of small fatigue crack in nickel-base superalloy at elevated temperatures (Q. Chen et al.). Small Cracks in Advanced Materials. Cyclic-fatigue crack initiation and propagation in ceramics (H. Kishimoto, A. Ueno). Initiation and growth mechanism of small fatigue cracks in SiC/AI composites (M. Jono). Experimental Techniques. How to measure small cracks by nanosecond acoustic microscopy (G.A.D. Briggs et al.). Fretting Fatigue. Small crack methodologies and crack arrest in fretting fatigue (D. Nowell, J.A. Araújo). Mixed-Mode, Variable Amplitude and Thermal Shock Loading. Analysis of small fatigue-crack growth under two-step loading conditions (S. Ishihara, A.J. McEvily). The role of multiaxial stresses in the development of small fatigue cracks in turbine engine blades (M.D. Sensmeier, T.F. Tibbals). Engineering Applications. Application of small-crack theory to aircraft materials (J.C. Newman Jr.). Short fatigue crack propagation at spot welds: experiments and simulations (H.F. Henrysson). Subject index. Author index.